Anytime that rain is making its way into the Kansas City weather forecast motorcyclists need to take caution on what that can do to the roads in and around the metro. On days when the roads are wet four different surfaces get especially wet during rainy days. During winter with all the chemicals that get put on the road to keep those from freezing over, the chemicals can cause cracks in the pavement. When water seeps down into the cracks and freezes it can start the beginning of a pothole. Out of all the seasons of the year, spring is when we find the most potholes. A pothole may appear to be shallow, but can be very deep. While riding avoid any kind of puddles. Painted lines on roadways can get very slick while riding. However, crosswalks can be extremely slick when you are trying to make a turn on your bike. When approaching a crosswalk when it’s wet, keep in mind that it can be slick and very dangerous to make a turn at your normal turning speed. Manhole covers, metal plates, bridge gratings and railroad tracks can become very slick when wet. These surfaces tend to be a magnet for dirt and oil. Once it rains the grease will float to the top of the water. Parking garages tend to have a smoother paved concrete than roads. When water gets on this particular type of concrete it gets very slick. When pulling into a parking garage throughout the metro keep in mind that it’s best to go a little slower. 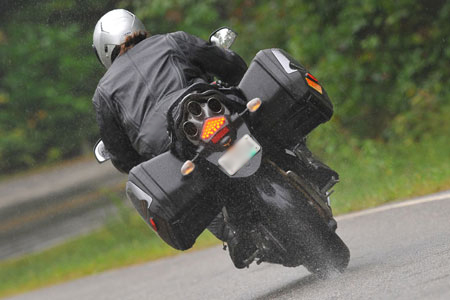 To prevent your motorcycle from hydroplaning or going down, slow down while going over any of these surfaces and ride upright instead of in a lean. If it is a wet day on the roads, please remember to wear clothing that is visible to see. Allow yourself plenty of room to maneuver and give yourself plenty of space. If you are injured during the rain due to someone else’s negligence while riding your motorcycle call Castle Law Office at 816-842-7100 or click here to email us. You’ll be glad you did!